State budget director Benjamin Barnes in a recent appearance before the state Spending Cap Commission. Despite approving a new deal to restructure pension costs, state employee unions remain the focal point in what’s shaping up to be a painful struggle to balance Connecticut’s next budget. With Gov. Dannel P. Malloy’s proposal less than seven weeks away, his budget director warned that, unless unions grant further concessions, avoiding major tax hikes probably would require significant cuts to municipal aid, social services and higher education — and more layoffs. And even with concessions, officials cannot avoid these other sensitive areas entirely, Office of Policy and Management Secretary Ben Barnes told The Mirror last week. But labor leaders reject that argument. The way to preserve local aid, state jobs and vital services, they say, is to ask more from the wealthy and to slash robust subsidies and breaks for businesses. Those resources are being strained as never before as state officials tackle retirement benefit costs surging now to make up for more than seven decades of inadequate funding. The $1.56 billion payment owed to the state employees’ pension fund next fiscal year is roughly double what Connecticut paid in 2010 — the year before Malloy became governor. The $1.29 billion payment owed to the teachers’ pension next fiscal year is up 28 percent from this year, and also is more than double the 2010 contribution. And the $797 million projected cost for retiree health care includes a new $120 million component to help save for future retirees’ care. The total cost next fiscal year is 51 percent higher than it was in 2010. Each of the two pension contributions was projected to spike — possibly beyond $6 billion per year — in the early 2030s. And even with the extra $120 million contribution, Connecticut is saving less than half the funds it should to cover the retirement health care costs of current employees. Malloy and unions reached a deal earlier this month that limits the growth in state employee pension costs over the next decade and a half by shifting at least $13.8 billion in expenses owed between now and 2032 onto a future generation. Barnes said the administration also is pressing for more traditional union concessions. 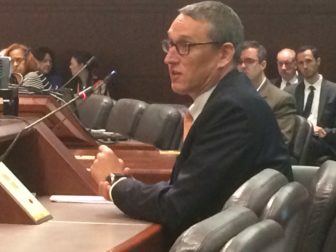 Connecticut no longer can afford its “extraordinarily generous retiree health benefits, and if our employees wish to maintain them at that level, they are going to have to pay more, or we’re going to have to reduce the generosity of those benefits,” he said. Senate Minority Leader Len Fasano, R-North Haven. 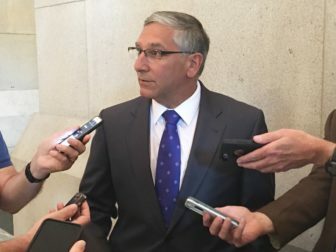 Senate Minority Leader Len Fasano, R-North Haven, said the state employees pension restructuring was “incomplete,” and the administration should have insisted on worker sacrifices as part of that deal. Had Malloy done so, he might have been denied the ability to restructure pensions. Any deal affecting workers’ benefits or contributions would require approval from rank-and-file union members, and not just from union leaders. But by agreeing to an initial deal that included no sacrifice, Malloy “just lost an edge,” Fasano said, making it harder to get more from unions in a second round of talks. Further compounding matters, nonpartisan analysts say state finances, unless adjusted, are on pace to run $1.5 billion in deficit next fiscal year, and $1.6 billion in the red in 2018-19. Both shortfalls represent about 8 percent of the General Fund. Is there ‘low-hanging fruit’ left in the budget ? The restructuring deal trims pension costs about $90 million next fiscal year. But, Barnes said, unless unions help lower benefit costs significantly more, areas cut deeply in the last few budgets — social services and higher education — will be back on the chopping block. And municipal aid, which largely has been spared from the budget axe under Malloy, can be shielded no longer, Barnes said, adding that any easy-to-achieve and relatively painless budget cuts of significant value were used up years ago. While the administration always is seeking new ways to improve efficiency, “We really cut out that low-hanging fruit,” Barnes said. Major statutory grants to communities total about $3 billion and represent about one-sixth of the General Fund. Factor in state payments for municipal school construction and to cover teachers’ pensions, and the assistance is roughly $5 billion this year. S&P Global Ratings, a Wall Street credit rating agency, warned in late October that any major shift in state aid to cities and towns could harm municipalities’ ability to get affordable credit. “S&P’s warning only serves to reinforce the importance of maintaining the state’s funding commitments to towns and cities and especially the distressed urban centers,” Kevin Maloney, spokesman for the Connecticut Conference of Municipalities, said at that time. But labor leaders say it’s unfair to punish today’s workers because Connecticut failed to save adequately in decades past. And the state does have choices other than slashing local aid. 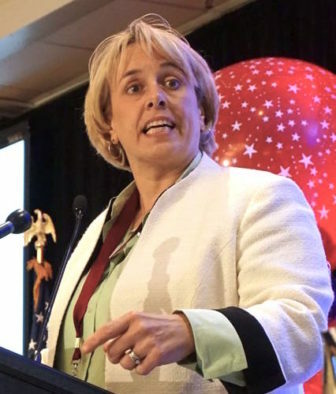 While part of the budget solution involves higher taxes on the wealthy, said Lori Pelletier, head of the Connecticut AFL-CIO, state officials haven’t come close to eliminating all wasteful and unnecessary spending. “There are ways of cutting without cutting jobs, without cutting services, without hurting state employees,” she said. Pelletier cited the millions of dollars in tax breaks and subsidies provided annually. And while many of those have value, such as the sales tax exemption on groceries, others are exemptions for businesses that are never tested or reviewed to determine if they return any economic value, she said. For example, Connecticut will waive $2.5 million in sales tax receipts to exempt winter storage of non-commercial boats. Labor leaders also said it is difficult for state workers to be told they must sacrifice when Connecticut has provided more than $85 million in bonding and tax incentives combined to two major hedge funds this year. And while Malloy, Barnes and many Republican legislators caution against raising taxes further on high-income households, arguing it could prompt them to flee the state, union leaders disagree. While Connecticut boasts some of the highest per capita income in the nation, the top marginal rate on its income tax is 6.99 percent, compared with rates closer to 9 percent for New York and New Jersey. And since 2011, Connecticut has whittled a $500 state income tax credit that helps the middle class offset property tax costs down to $200, and has eliminated a popular sales tax exemption on clothing and footwear costing less than $50. Labor leaders also have noted neither layoffs nor concessions would be likely to provide enough savings to preserve local aid, and that further state tax hikes are unavoidable. The 2011 concessions deal union workers negotiated with Malloy – which featured a two-year wage freeze, new restrictions on health care and retirement benefits, and an employee wellness program – produced annual savings of about $650 million, according to nonpartisan analysts. They also project the savings from about 2,000 layoffs are just over $130 million per year. Defenders of Connecticut’s tax system note that New York and New Jersey’s income tax allows more deductions than Connecticut’s does. More important, Barnes said, is that Connecticut achieved prosperity in decades’ past because of the attractiveness of its tax code. More layoffs in the works? So what happens if the standoff between Malloy and labor unions remains when the governor’s budget proposal is due to lawmakers on Feb. 8? Barnes declined to disclose specifics, but warned the administration has not ruled out accelerating worker layoffs, even though it has struggled to hit downsizing targets the governor set last April. State government has laid off nearly 1,100 workers so far this fiscal year, less than the 2,000 layoffs Malloy originally anticipated. In part that’s because the administration has slimmed considerably through attrition since 2011. The Executive Branch, excluding higher education, employs 9.4 percent fewer workers than it did before Malloy took office. Still, Barnes said even more labor savings — achieved one way or another — need to be part of the next biennial budget. Residents turned to municipal bonds to lower their tax burden, which in turn lowered borrowing rates for state governments. Legislative leaders said the lawsuit has fueled concerns about whether municipalities like Hartford have the ability to defend themselves against a constitutional claim.